This soap cutter is the Ultimate in Cold Processed Soap Cutting! 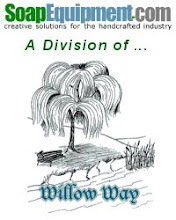 The Willow Way Air Soap Cutter™ can produce thousands of perfect bars a day by one person. A full production, Custom Made soap cutter designed to your specifications, bar and batch size. Cuts both Loaves and Bars with One piece of equipment. You can cut hundreds of perfect bars in just minutes. Cut hundreds of bars in minutes! Thousands per day! Less labor, Less cost per bar. Cut thousands of bars a day with one person! Less labor and time means less cost per bar-Equals More Profit! We custom make your cutting Frames and cutting tables to your specifications. Linear bearings; high-speed, drill-rod guides; ball bearing gliding table; 2” (5cm) box tubing frame, precision machined mounts and fittings. Protected with a tough, baked on powder coat, enamel finish. Extra Cutting Frames and Tables for different full size bars or hotel size bars are available. The Air Soap Cutter™ is only 32" (81cm) wide x 40" (102cm) long and is 43” (109cm) high.